I completed a couple new art projects recently, both of which are headed to the U.K. for potential gallery exhibits. The cool thing about these two projects is artists from all over the world are involved. This project involved using a mailer as a canvas with the address as part of the art. My choice was to use a box (instead of envelope). 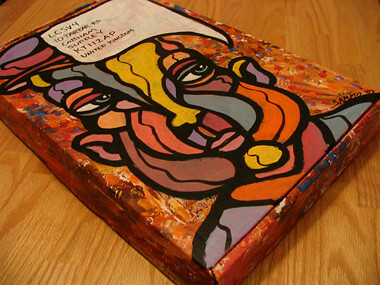 I liked the idea that the box looked something like a real canvas.... it should look good hanging on a gallery wall. This project originally began in the U.K. with 24 wooden blocks and has exploded to more than 120. This project involved painting a small block of wood (appx. 1.25" square). I'm not used to painting such a small object much less in 3 dimensions. Definitely challenging and fun.